Rare edition with unique illustrations and elegant classic cream paper. The "two cities" are Paris in the time of the French Revolution, and London. 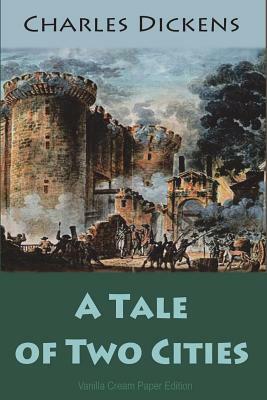 Dr. Manette, a French physician, having been called in to treat a young peasant and his sister, realizes that they have been cruelly abused by the Marquis de St. Evremonde and his brother. To ensure Dr. Manette's silence, the Marquis has him confined for eighteen years in the Bastille. The doctor has just been released, demented, when the story opens. He is brought to England where he gradually recovers his health and his sanity. Charles Darnay, concealing under that false name his identity as the nephew of the cruel Marquis, has left France and renounced his heritage. He falls in love with Lucie, Dr. Manette's daughter, and they are happily married. During the Terror, he goes to Paris to save a servant condemned by the mob. Darnay himself is arrested, condemned to death, and is saved at the last moment by Sydney Carton, a reckless wastrel who acts out of devotion to Lucie. Carton smuggles Darnay out of prison and takes his place on the scaffold, declaring "It's a far, far better thing I do than I have ever done before," surely one of the most quoted lines in all the history of literature. Includes vintage illustration.